Business software giant SAP has completed its acquisition of 'experience management' (XM) software specialist Qualtrics. Founded as a DIY survey technology firm by father and sons Scott, Ryan and Jared Smith and family friend Stuart Orgill, Qualtrics now helps clients manage 'the four core experiences of business' - customer, product, employee and brand experience - on one platform. The sale to SAP was announced in November and priced at $US 8bn in cash. 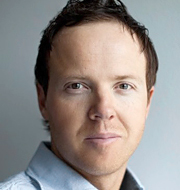 As part of the deal, the firm's experience data and insights will be combined with operational data from SAP software, and Ryan Smith (pictured) will continue to lead Qualtrics, which will retain its current leadership, personnel, branding and company culture and operate as an entity within SAP's Cloud Business Group. Qualtrics will continue to maintain dual headquarters in Provo, Utah, and Seattle, Washington. In a statement, SAP said: 'By tapping into SAP's more than 413,000 customers and global sales force of around 15,000, Qualtrics will be able to scale rapidly around the world. SAP has a strong track record of accelerating the growth of the innovative companies it acquires, as exemplified by the rapid success of SAP's recent acquisitions'. Web sites: www.sap.com and www.qualtrics.com .